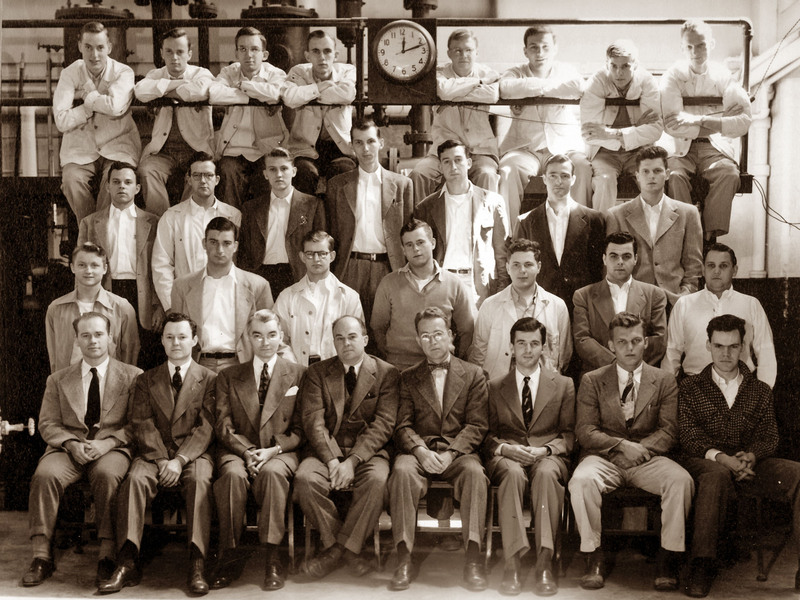 Members of the Princeton class of 1948. Note the white work jackets. Now why did we invent the helmet? Well, because we were participating in many activities that were cracking our heads. We looked at the situation. We chose not to avoid these activities, but to just make little plastic hats so that we can continue our head-cracking lifestyles. 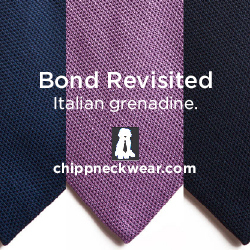 Fortunately for us, we’ve long applied the same logic to clothing, devising clever ways to protect the (presumably stylish) clothes we were ruining by staining or ripping them, ways that eventually became stylish themselves. Most notably, after years of protecting our clothing, coveralls and overalls (originally worn to cover your clothes) have for over a century been worn casually as denim jeans. 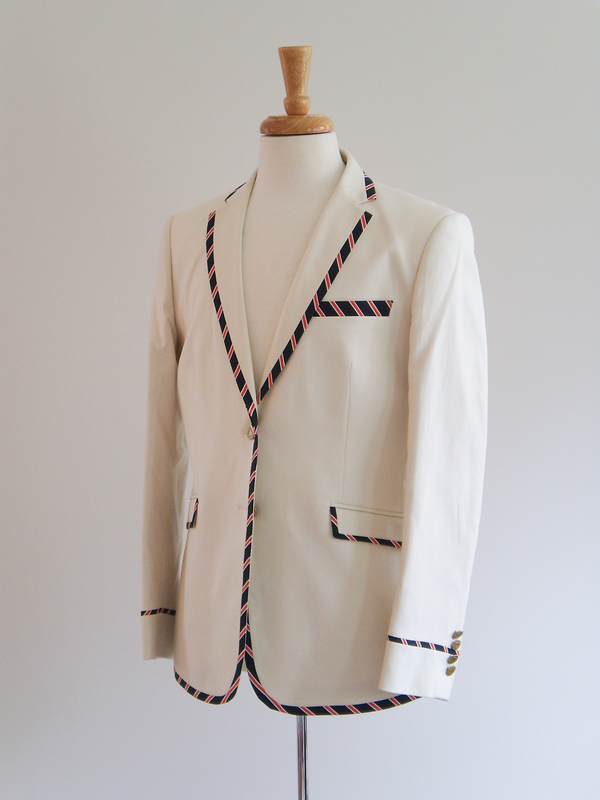 Another, perhaps less universal example is the drinking jacket, a jacket that’s not just Ivy, it’s Princeton University specific. I’m not sure whether it’s a testament to the superiority of Princetonians’ intellect or a mark against them, but, allegedly, in the early 1900s, Princeton students out drinking were spilling beer on their clothes (as one does). Their solution was not to drink less, or at least less boisterously, but rather to wear coveralls that would protect their clothing from airborne beer. One year, the whole class of 1913, somewhere in the area of 1,000 people, wore overalls and work jackets in commencement ceremony (a foreshadowing of a century of co-opting workwear by non-workers?). It started a tradition that continues today. The original high low design? 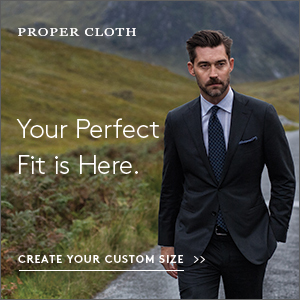 A chore coat from Brooks Brothers. 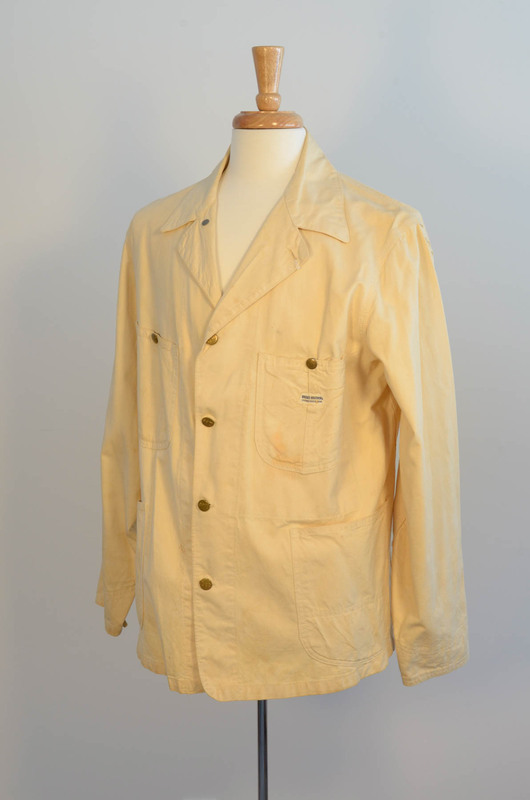 Work jackets in the 1910s meant chore jackets, so less Levis style and more Post Overalls/French work jacket style — sportcoat length or so, with button fronts, some with shirt-style straight collars and others with lapels. Princeton classes would stencil the jackets to match, with inside jokes and irreverent nods to trends and events, and personalize them further. 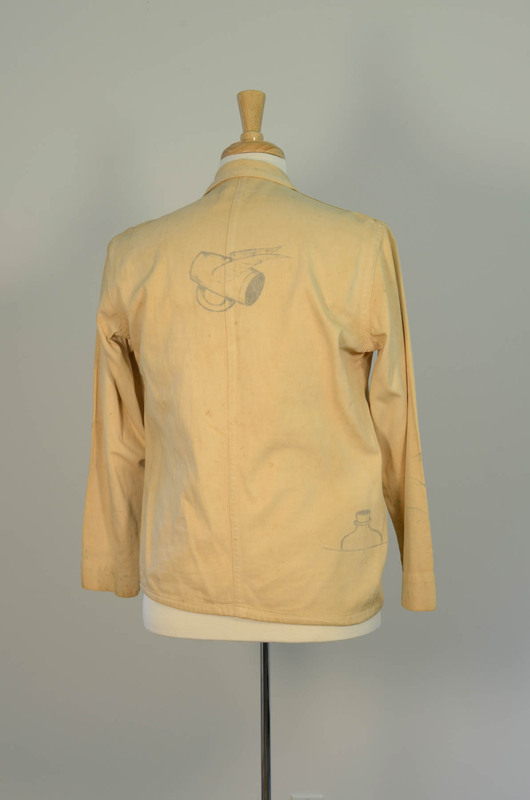 For example, the oldest such jacket in Princeton’s collection of the jackets, from 1922, depicts a beer mug flying away and a trompe l’oeil flask in its pocket, a reference to covert drinking during Prohibition. 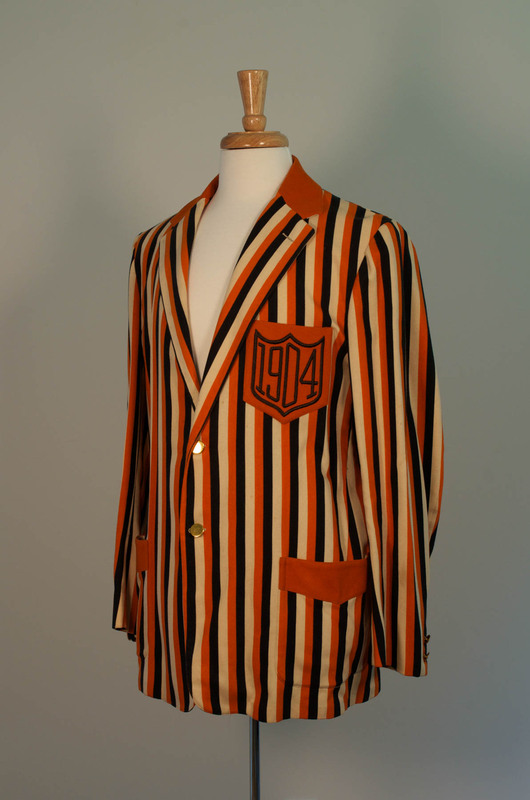 A 1922 Princeton beer jacket. 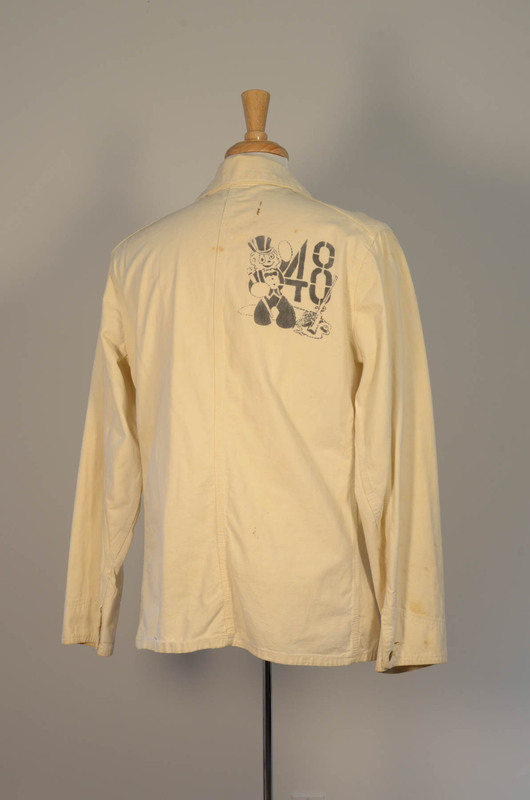 Designing and wearing beer jackets became a tradition for graduating classes, and some elements of the stencil design settled in in the 1930s–most would feature a tiger (Princeton’s mascot) and the graduation year. Later jackets would riff on military service in World War II, development of nuclear bombs, politics, university trends the students were happy or unhappy with. Given that Princeton graduating classes were all male until 1970, some are a little suggestive. Orwell’s 1984-related jokes were probably hard to avoid in 1984. 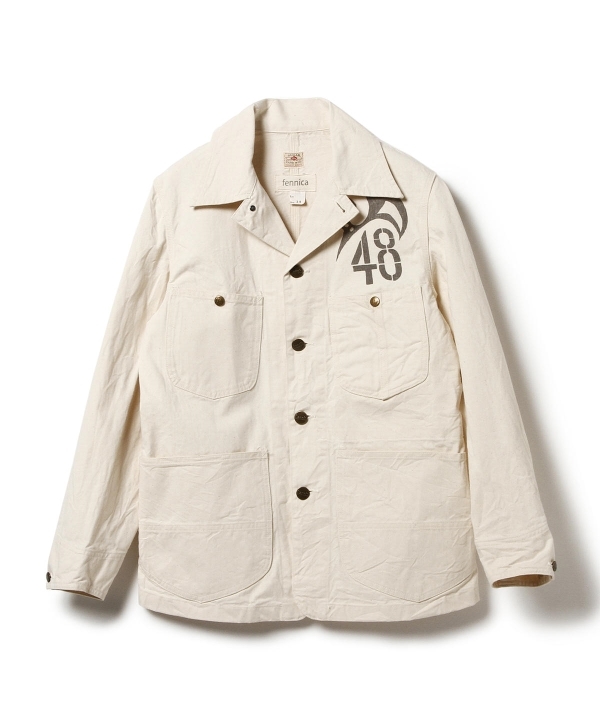 In the 1980s and 1990s, the jackets moved away from the antiquated white chore coats and the boozier tradition to trucker styles and eventually to the modern version. They’re now known more officially as the senior jacket rather than the beer jacket, and generally done in a windbreaker style with a class-unique, but less folk-y or “humorous,” graphic design. I’d been looking at a riff on the drinking jacket for years without realizing it. 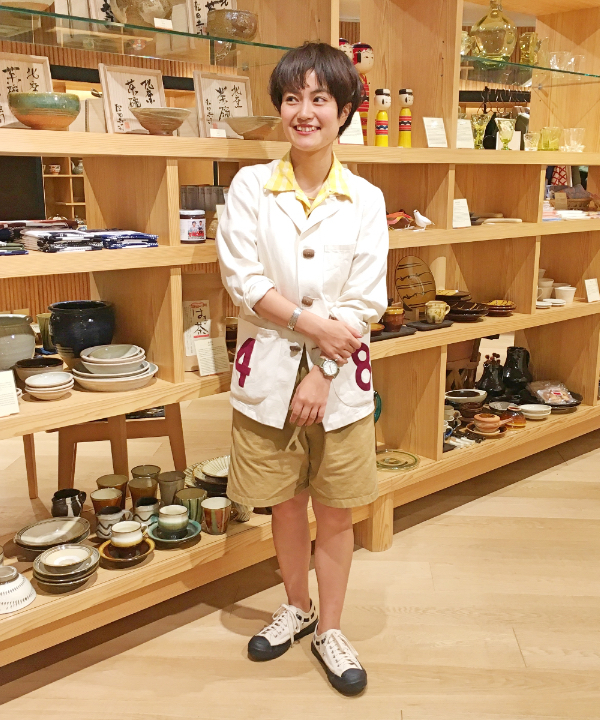 Fennica, the sub-brand of Japan’s Beams (we previously interviewed Fennica buyer Terry Ellis), has been making takes on the drinking jacket for years. This year, they’ve designed a simple stenciled version manufactured by Sugar Cane. 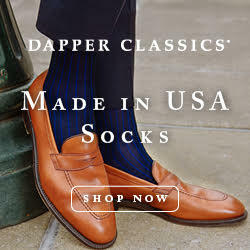 In the past, they’ve done them with Buzz Rickson’s, including women’s models, which would’ve been unimaginable in the 1940s. I think they’re an interesting take on the style, and not so Princeton-specific as to draw weird questions as a non-Tiger. Terry Ellis in a Fennica drinking jacket. 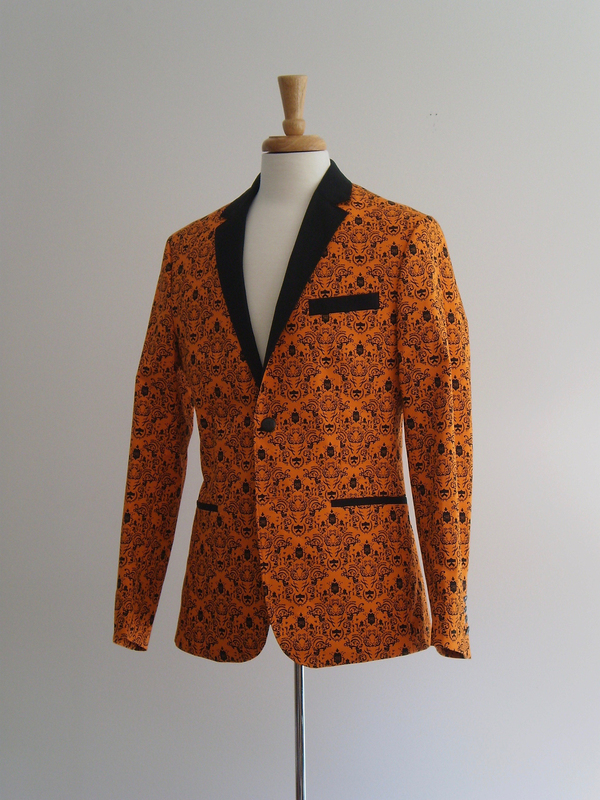 Princeton also has a tradition of reunion jackets, which are a little more refined than the beer jackets of undergrads. 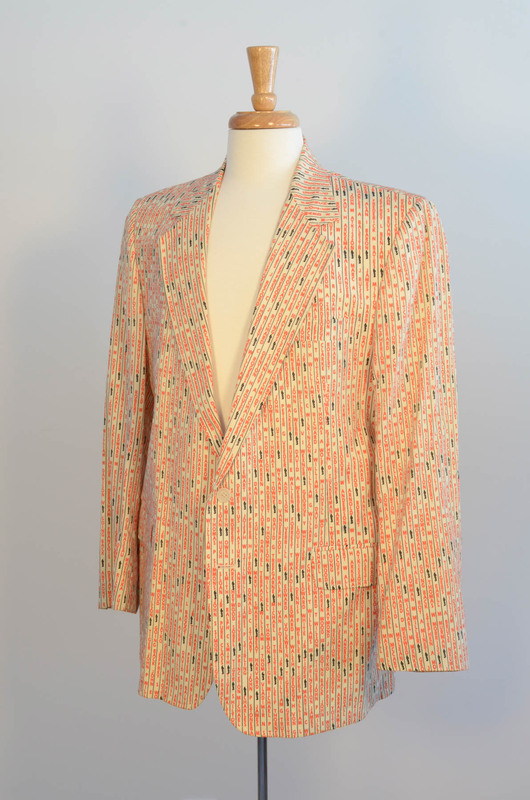 Generally worn by grads returning for their 25th reunion, these are sportcoats, not chore coats — presumably you’ve gone and done something with your life at that point. Rather than using stencils, the reunion jackets typically incorporate tigers, orange and black, and graduation year in the fabric of the jacket. 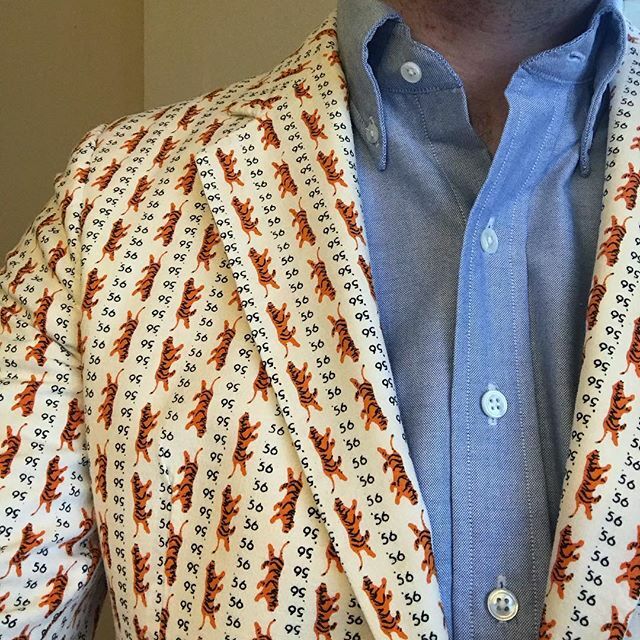 I was tipped off on the jackets by Ryan Skinner, who I noticed what initially just looked like a rad vintage sportcoat on Instagram, which turned out to be a class of ’56 original. 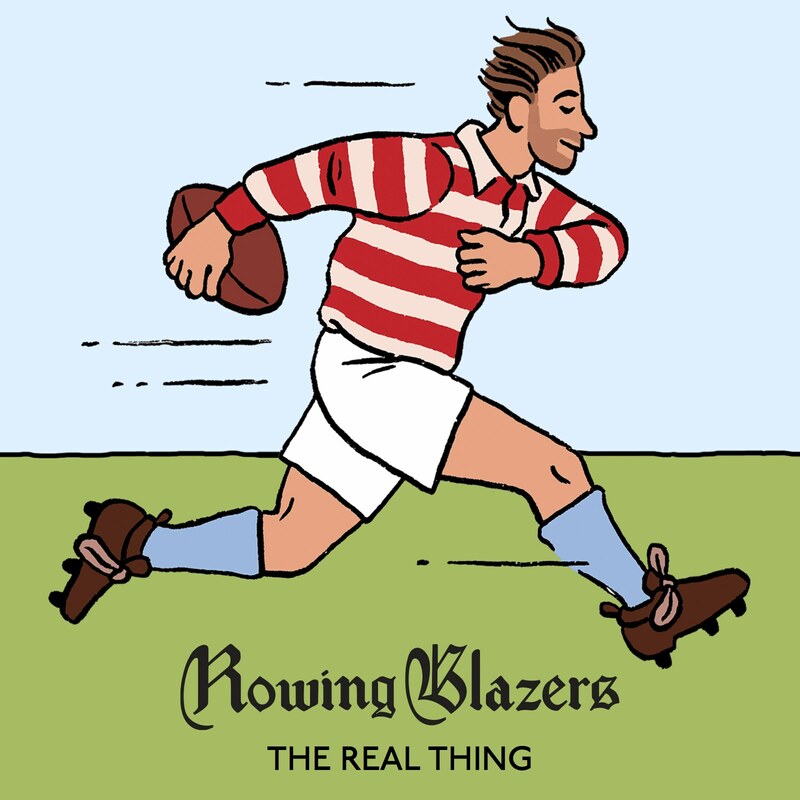 Designs have really run the gamut over the years, from elaborate, ceremonial styles, to “rowing blazer” style striped and piped jackets, to simple orange sportcoats, to the most recent version, printed on stretch cotton (sorry, trads). 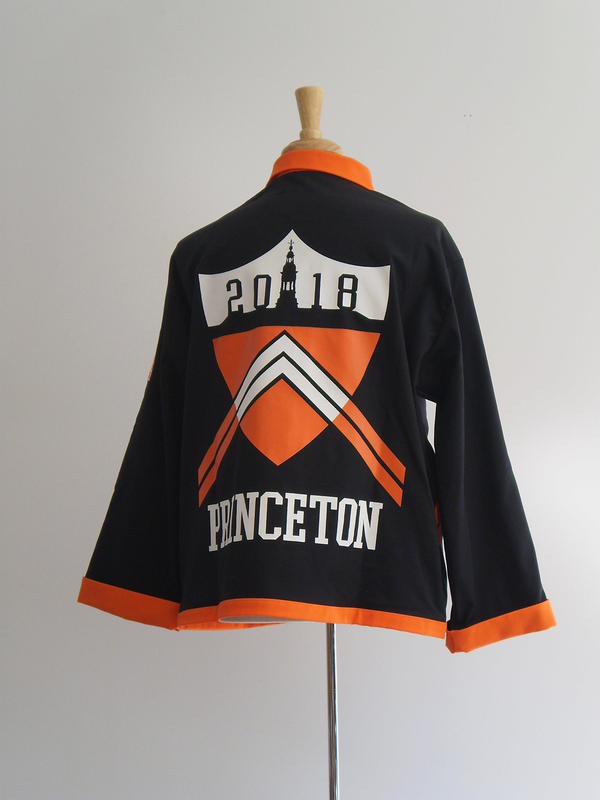 I occasionally run into reunion jackets in eBay and Etsy searches, although I might hesitate to wear one without a connection to Princeton U. Beer jackets, though, I find really interesting in a similar way to stenciled and hand decorated military and motorcycle jackets. 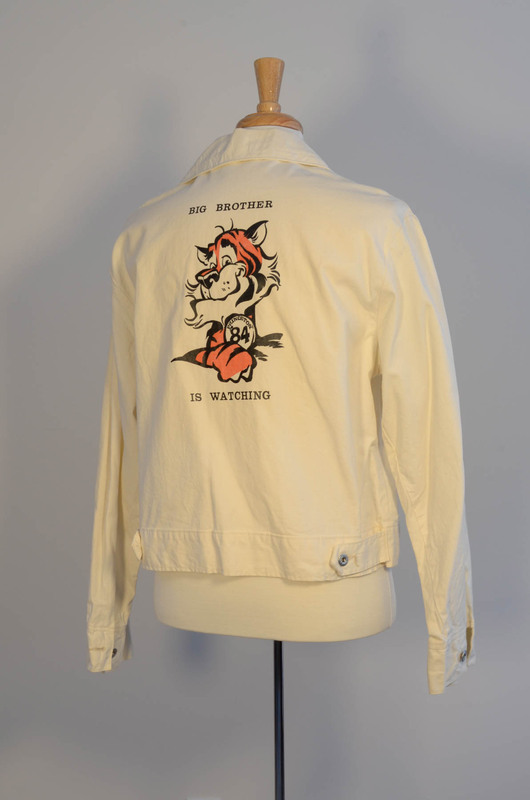 See many more images of Princeton beer and reunion jackets in Princeton’s museum of Princetoniana.